JFK Airport has been trying to get a handle on a backlog of flights after the blizzard, leaving passengers stranded. An accident on the tarmac made things even worse. Rana Novini reports. Departure delays were slowly improving Saturday night at John F. Kennedy Airport, where workers have been struggling to get a handle on a backlog of flights after Thursday's ferocious snowstorm -- a problem made all the worse after two passenger jets collided on the runway earlier in the day. 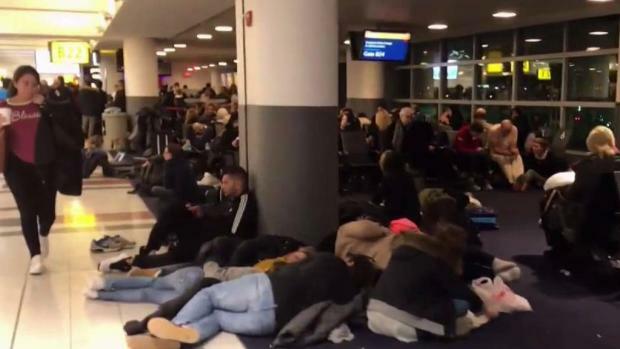 Passengers captured images of airport misery Saturday: massive crowds, widespread confusion, people sleeping on the floor and arriving flights stuck on the tarmac for hours. "Madness. There's like two planes full of people at each gate," passenger Julia Knitel said of the conditions in the airport. One family's flight was ultimately canceled and rebooked for Wednesday. "The lines were going around all sorts of corners. It's complete pandemonium," one of them said. Passengers at describe chaos and long waits at JFK airports, where two planes collided on the tarmac. Rana Novini reports. A man said he was in a plane on the tarmac for four hours. "They got grumpy," he said of the passengers onboard. A missing flight attendant added to an hours-long delay at one gate, where fighting broke out and police were brought in to keep things under control, according to a passenger. Outside the airport at arrivals, it was just as chaotic and congested as people waited for their loved ones. Some passengers reported waiting hours at baggage claim. Juan Cuellar was in the airport five hours before he finally left. "It's crazy, it's unbelievable," he said. "People are really mad because once they get out -- five hours wait -- they have to wait like one hour for their baggage. So it's a really long time." Port Authority, which manages all three of the major airports serving New York City, said a number of factors led to a backlog at gates and that it expected delays to continue into the evening because bitter cold was causing equipment issues on the ground. "A surge in flights at JFK Airport, produced by the rescheduling of delayed flights, combined with the effects of the winter storm, which severely disabled equipment, has resulted in terminal operators and airlines experiencing delays in getting planes and their passengers into their gates," Port Authority said. Things were only made worse when the right wing of a China Southern plane hit the tail of a Kuwait Airways airliner, damaging both aircrafts, according to the Port Authority. The China Southern flight was being towed when the planes collided shortly after midnight, the FAA said. Both planes are Boeing 777s. No one was injured and all the passengers got off safely, but the collission only added to the mess. Kuwait Airways said on Twitter that Flight 118 from New York to Kuwait was struck by the Chinese plane as it was parked before takeoff. The airline said it was working with authorities in New York to investigate. The Kuwait Airways passengers were taken to hotels as they waited for alternative flights, the airline said. The China Southern plane didn't have any passengers at the time, according to the Port Authority. By Saturday evening, the Port Authority said it was still working to limit flights coming into JFK until there were enough gates available to handle the backlog. The authority was providing portable staircases and buses to deplane passengers and bring them into the terminal. Passengers complained of lengthy waits on planes and in the terminal since Friday afternoon. "@JFKairport 3 hours on the tarmac waiting for a gate tonight. Pilot saying airport control is "chaotic". Is anyone there?," tweeted one passenger who had landed on a flight from Germany at 8 p.m.
Another passenger, meanwhile, said that passengers began calling 911 from the plane while they waited and others began "to threaten to break open the emergency exit." He also reported a fellow passenger was going through a medical episode and complained about heart conditions. "This is illegal," he tweeted. According to air travel tracking service Flightradar 24, dozens of planes had the same issues after landing. At midnight, it posted a screenshot of ground traffic at the airport showing what appear to be several dozen planes sitting in apparent waits for gates. "After landing 3.5 hours ago, #DY7019 awaits a gate. Unfortunately for passengers at JFK tonight, they have plenty of company," the service tweeted. Later, the airline said the plane made it to a gate after 4 hours -- and after circling the entire airport. Departing flights weren't much better off: social media users were also reporting takeoff delays as well. One traveler even posted a video of a fellow passenger playing violin at their gate to pass the time. The situation comes the same day an American Airlines flight had to return to the airport following takeoff after a mechanical failure.